Luxury perfume house Krigler was started in 1905 in St. Petersburg, Russia and has been creating fragrances for luminaries and royalty like JFK, Audrey Hepburn and Grace Kelly since the 1920’s. Known for their luxurious but subtle scents, Krigler Perfumer has made a name for itself by crafting fragrances that are timeless, gorgeous and wearable. Adhering to the motto that if a person is complimented on how fabulous they smell, and not on the perfume they are wearing, then Krigler suggests you are wearing the perfect scent for you. Never over-powering and always timeless, Krigler perfumes enhance the aura of the wearer; and judging by their long history and famed clientele they have succeeded at doing just that. Exotic locales which evoke powerful scent memories and fragrant associations are also the inspiration for this iconic company and Oud For Highness doesn’t disappoint. Originally formulated in 1975 for King Hussein of Jordan and re-released in 2010, Oud For Highness 75 is a beautiful and exquisite scent that conjures up the exoticism and mystery of the Middle East. An elegant unisex fragrance, Oud For Highness is surprisingly light and delicate; quite a departure from the heady, rich ouds currently infiltrating the fragrance market. The succulent wood note at its top quickly lends itself to amber and saffron but it is the dry down that makes OFH creamy and lush; honey and sandalwood remain, leaving only a memory of the intense and rare agarwood on the skin. Also fit for a king, the Krigler Boutique at the Plaza Hotel in New York City is where you can see, smell and purchase all of what this extraordinary perfumer has to offer. Krigler has had a relationship with the Manhattan landmark since 1930 and shortly after the hotel’s major renovation in 2007, the alliance was rekindled. Tucked away in the Shops at The Plaza, this treasure box of fragrance can be found and upon opening its doors the true crown jewel is revealed: the promise of timeless, classic luxury and a scent that is perfect for you. Tres chic. Oh Ashleigh, I must try this! It sounds like something I would surely love. Thank you for the great review. Next time I'm in NYC I am so there..
Why am I just recently hearing about the Krigler perfumes? This sounds just fabulous! Love the bottle too! Sounds interesting. 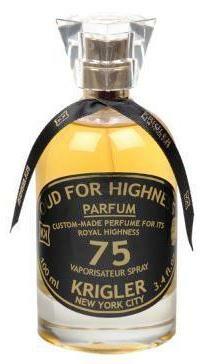 I'm as curious to sample the late King's taste in perfumes as I am to try Krigler's interpretation of an oud perfume.